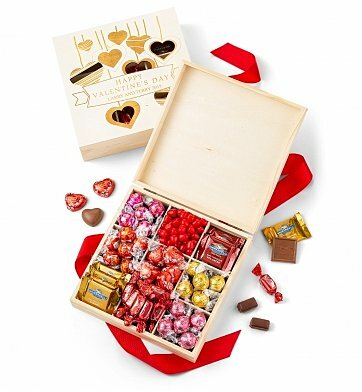 Nine compartments are filled to the brim with luxury chocolates from Lindt, Ghirardelli and much more, inside this custom Valentine's Day box. Engrave the lid with your own personal message underneath the greeting "Happy Valentine's Day". Lindor Truffles by Lindt in White Chocolate, Milk Chocolate. Lindor Truffles by Lindt in Strawberries and Cream. Ghirardelli Chocolate Squares and more. Free Engraving! Complete the personalization option at checkout and we'll engrave your chosen message on the lid of this keepsake crate. One line with up to 30 characters underneath "Happy Valentine's Day". Personalized Valentine's Day Chocolate Box is a hand delivered gift. These gifts are delivered by one of our local design centers located throughout the United States and Canada. Same day delivery is available for most gifts when ordered before the cutoff time. The cutoff time for Personalized Valentine's Day Chocolate Box is in the recipient's time zone.